Communication is one decisive factor when dealing with people. Thus, the competence in the area of interpersonal communication (communication between people) is determining and essential in any interaction. An additional point, therefore, in courses, seminars and workshops of AllboutEnglish is the training to adequately communicate in English as well as in German. Communicative training and communication as such reflects more than simply the learning and practicing of standard formulations and the respective word choice!!! 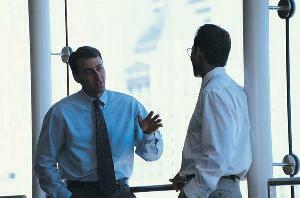 Verbal and non-verbal communication takes up a leading role in every conversation, in every action. For not only words alone but also language in general, i. e. tonality, mimics, gestures, manipulation, body language play a crucial role. Participants of this course will hear and see on the basis of recordings what kind of effect they have on their dialogue partner. Thus, they become aware of the meaning of effective communication and learn to use exactly those strategies in communication with others – be it business partner, superior, colleagues or friends. Communication training with AllboutEnglish helps you increase the efficiency and results of / in conversations..
Zuhören – Neigung zum Nicht-Hören Fragetechniken in verschiedenen Situationen Die Macht der Worte – geeigneter Wortschatz für situative Formulierungen Empathie und Sympathie – bitte nie vergessen Dialektik mit Überzeugungskraft – was hat der Dialekt damit zu tun? Videoaufzeichnungen, Trainerinput, Gruppenfeedback veranschaulichen und erklären die eigenen Schwächen und Stärken. Vorschläge und Tipps zur Förderung des individuell bestehenden Potentials werden gemeinsam erarbeitet und gegeben. Rollenspiele, Kurzreferate und Gruppenarbeiten werden unterstützend dazu angewandt. Diese Website benutzt Cookies. Wenn Sie diese Website weiter nutzten, gehen wir von Ihrem Einverständnis aus. Mehr Information.